Hello fellow traders. In today's blog, we will have a look at the recent price action of the WYNN Resorts Ltd. stock. The stock is listed in the Nasdaq 100 and the S&P500. WYNN Resorts Ltd. is an American company which is based on the Las Vegas Strip in Nevada. It is an operator of high-end hotels and casinos. It was founded in 2002 from billionaire Steve Wynn. An American real estate businessman who is known to be involved in American luxury casino and hotel industry. In the last couple of days there where some rumors going on about a possible Company takeover. WYNN Resorts has been planning to buy Crown Resorts. Which is Australia's largest entertainment and gaming group. Crown Resorts has a market capitalization of over $8.7 billion. 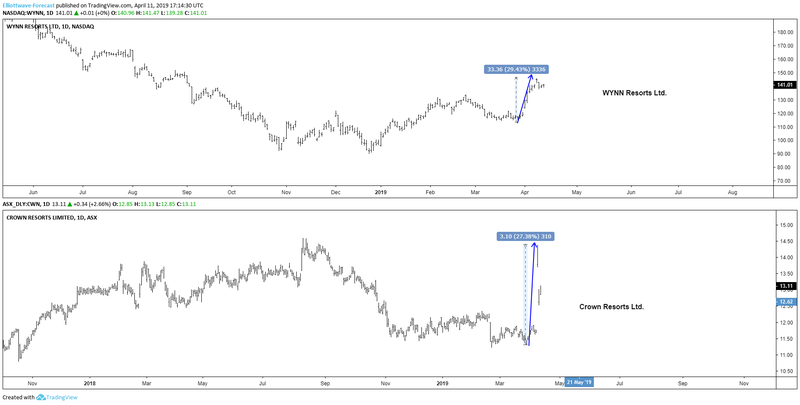 Due to the possible takeover, the WYNN Resorts and the Crown Resort stocks have been soaring higher in the last couple of days. Which you can see below. Now let's have a look at the technical perspective and the possible upside targets mainly in the WYNN Resorts stock. In the chart above you can see that the stock clearly ended the cycle from June 2018 peak at its December 2018 low ($89.98). Above from there, it managed to break the descending trendline and that was the first indication of a bigger bounce in process. Last week it managed to break the 02/25/19 peak ($133.49) making it a higher high sequence. Now with the recent break higher. The cycle from 12/25/18 low is now incomplete. Which means it should ideally see the equal legs extreme area from 12/25 low. Which comes towards $157.39-$167.61 areas. Where sellers can be waiting again for a 3 waves reaction at least. With the possible takeover of Crown Resorts. WYNN notched over 30%. Making it bullish against 03/27/19 low ($112.93). As long as it stays above that low. It should be supported in the sequences of 3-7 or 11 swings, targeting the $157.39+ areas. This can coincide with the latest bullish fundamental news about the Company as well. Helping the stock for further recoveries.